History: (What If? I#19) - After a successful wrestling match, the new celebrity Spider-Man witnessed a robber and thought to himself how helping the cop would help him as well. He quickly halted the thief and made the next day's issue of the Daily Globe. As J. Jonah Jameson lost his cool over the Globe's exclusive, Spider-Man met with film producer J. B. Priest about a movie deal. Later that night, after brushing off "Flash" Thompson at school, Peter Parker once again donned his Spider-Man costume and guest-hosted on The Tonight Show Starring Johnny Carson where he interviewed an actress. The episode was interrupted with a news report announcing the death of John Jameson and when Peter returned home, he revealed his identity to his aunt and uncle. When Ben tried to talk Peter out of becoming a celebrity and focusing on his education, Peter angrily left them and in the time that followed, Spider-Man became a successful movie star with The Amazing Spider-Man, starring Marlon Brando and Gene Hackman. When J. Jonah Jameson had Ned Leeds figure out Spider-Man's identity and published it in the Daily Bugle, Spider-Man threatened Jameson's life, then passed it off as a joke to get the point across not to cross him again. The next day, Spider-Man set off to start the next phase of his career by sneaking into the Baxter Building. After "testing" the Fantastic Four, Spider-Man offered them his services as their licensing and promotion agent. In the weeks that followed, Spider-Man also signed up the Avengers and the X-Men, following that up with buying Marvel Comics. After witnessing Daredevil's battle with the Fixer, Spider-Man offered his services to Daredevil. Spider-Man's first act was to replace Daredevil's yellow costume with a red costume involving a trident which angered Daredevil, who thought the trident was pointless. Despite that, Spider-Man remained Daredevil's agent and placed billboards around the city promoting the hero. Determined to discredit Spider-Man, J. Jonah Jameson wrote an article for the Daily Bugle announcing its federal court suit against Spider-Man's promotion of a vigilante. 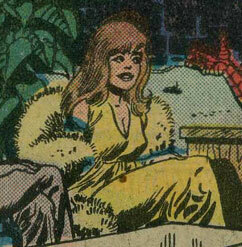 In an effort to ruin Jameson in retaliation, Spider-Man followed his secretary Betty Brant as she met with the Enforcers to pay off her brother's gambling debts. Discovering the Big Man's identity of Frederick Foswell, Spider-Man had the Daily Globe write an article revealing Foswell's connection to the Daily Bugle. The article cost Jameson his job when Lawrence Dyson tried to get Jonah to take a less direct hand with the Bugle, offering his emeritus status at full pay. Angry, Jonah resigned instead. When Foswell asked to see Jonah, Jonah met with him and was given the opportunity to use Foswell's organization to ruin Spider-Man at the expense of running his rackets for him. Jameson declined the offer but began thinking that he had nothing else to lose. Six months later, during the filming of Spider-Man vs. the Monster That Ate Los Angeles, Spider-Man was zapped by an unscripted electric shock given off by the film's monster Dragoom. Luckily, he was saved by Daredevil and later, Daredevil visited Peter Parker at his mansion and warned that the shock could have killed him. He also explained that Spider-Man had a hit out on him and offered to stay and watch Parker's workout, thinking that he might be in danger. During the workout, Parker was slashed with poison-tipped claws by a disguised Kraven the Hunter. Two days later, Parker finally agreed that someone was trying to hurt him. Soon after, Parker met with the writers of his next movie and just as Daredevil noticed the scent of spirit gum and latex, Parker fell through a trap door. When he recovered, he discovered that the "writers" were all supervillains in disguise. Daredevil immediately jumped to defend Spider-Man but was soon overwhelmed by the sheer number of villains. In order to save Daredevil's life, Parker also joined the fray as Spider-Man and too, defeating the villains one-by-one. After checking on the barely-breathing Daredevil, Spider-Man unmasked the mastermind behind the attack as J. Jonah Jameson, who blamed Spider-Man for everything in his life gone wrong. Spider-Man then realized that he had, in fact, destroyed Jameson's life by not acting responsibly with the gifts he had been given. (Spider-Verse I#2 (fb) - BTS) - Spider-Man from Earth-80219 was drawn into the multiversal conflict involving spider-totems from across the multiverse and the dimension-hopping Inheritors of Earth-001. Comments: Created by Peter Gillis, Pat Broderick, and Mike Esposito. 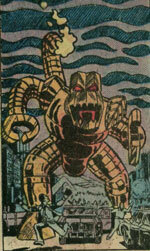 This reality diverged from events seen in Amazing Fantasy I#15 (August, 1962). Annie was a huge fan of Spider-Man's, waiting in line at the premier of The Amazing Spider-Man movie in an attempt to just touch him. Her friend Wanda reminded her what her boyfriend Harvey would say if he saw her acting so crazy over another man. The Avengers were basically the same as their Earth-616 counterparts up until Spider-Man took to becoming a superhero licensing and promotion agent. The Avengers agreed to allow Spider-Man to represent them and Spider-Man assured them that their name would be treated with the respect it deserved. They were (from left to right): Rick Jones, Iron Man, Thor, Captain America, Giant-Man, and Wasp. Pictured also is Spider-Man, who was not a member. 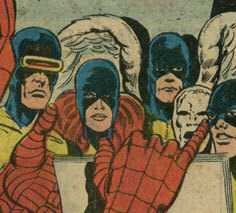 They all presumably had the same superpowers that their 616 counterparts had. Frederick Foswell was a reporter for the Daily Bugle who was also secretly a racketeer named the Big Man, just like his Earth-616 counterpart. After J. Jonah Jameson sent him to ask Spider-Man how his actions could injure children, Foswell was laughed out of the premier of Spider-Man's movie. Foswell returned to the Bugle and told Jameson what had happened, furthering Jameson's hatred of Spider-Man. After a bit of bad press from the Bugle, Spider-Man followed Jameson's secretary Betty Brant, who was kidnapped by the Big Man's thugs, the Enforcers. Witnessing the Big Man's identity of Foswell, Spider-Man wrote an article for the Daily Globe that revealed Foswell's connection to Jameson and eventually cost Jameson his job when Jameson resigned rather than take emeritus status at his own paper. 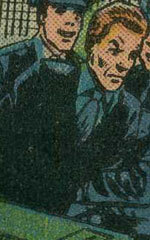 Not long after, Foswell asked to see Jameson in prison where he made an offer to Jameson that if Jameson would run his rackets while Foswell was in prison, Jameson could use the resources to destroy Spider-Man. At first Jameson refused but he later decided he had nothing to lose and used Foswell's connections to attack Spider-Man with an army of supervillains. 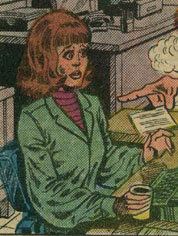 Betty Brant, like her Earth-616 counterpart, was the secretary to J. Jonah Jameson of the Daily Bugle. After Jameson began trying to discredit Spider-Man, he had Betty get her boyfriend Ned Leeds to find out Spider-Man's secret identity. 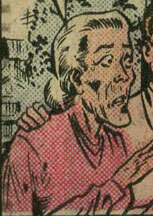 Betty was later abducted by the Enforcers in order for her to pay her brother's gambling debts to the Big Man. 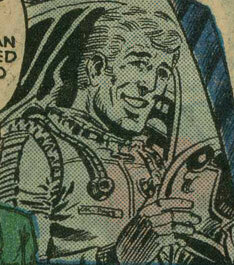 Bernard Bushkin, like his Earth-616 counterpart, was the editor of the Daily Globe. When the Daily Bugle filed a suit in court about Spider-Man supporting the vigilante Daredevil, Spider-Man retaliated by aiding Bushkin in writing an editorial revealing that Jameson employed Frederick Foswell, secretly known as the Big Man. Cheryl was known actress who was the guest on The Tonight Show when Spider-Man guest-hosted. Her promotion of her most recent movie was interrupted by Spider-Man advertising Ice-Blue deodorant spray. Chuckie was Spider-Man's assistant and when Daredevil confronted Spider-Man about the attempts on his life, Spider-Man asked Chuckie to fire the person in charge of the robotic Dragoom from his upcoming movie. He also reminded Chuckie that it was time for his workout. Daredevil was the same as his Earth-616 counterpart up until Spider-Man confronted him after he had defeated the Fixer and offered to be his agent. Daredevil hesitantly accepted but explained that he preferred to fight crime rather than promote himself. After Spider-Man began recommending costume designs (including one with a cape and trident weapon) to Daredevil, Daredevil opted to return to crimefighting while Spider-Man promoted him by posting billboards around the city. Eventually, someone began trying to kill Spider-Man and after Daredevil saved his life on the set of an upcoming movie, Daredevil decided to become Spider-Man's bodyguard. During a meeting concerning the upcoming Spider-Man movie, Daredevil noticed that the board of directors were all wearing masks and both he and Spider-Man were soon sent down a trap door. There they came face-to-face with numerous supervillains who had been paid to kill Spider-Man. Daredevil quickly jumped to Spider-Man's aid and was beaten nearly to death. Upon seeing Daredevil risk his life for his own, Spider-Man jumped in and defeated the villains, unmasking J. Jonah Jameson as the boss. Daredevil had superhuman senses and a radar-like sense of his surroundings, just like his Earth-616 counterpart. Doctor Octopus was the same as his Earth-616 counterpart, becoming a criminal despite having no interference from Spider-Man. He was hired by J. Jonah Jameson to destroy Spider-Man and aided in nearly beating Daredevil to death while trying to kill Spider-Man. 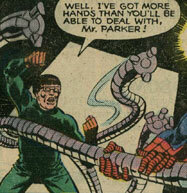 Once Spider-Man started fighting back, he made short work of Doctor Octopus. Doctor Octopus had four mechanical tentacles grafted to his body, just like his 616 counterpart. Dragoom was a robot created for the movie Spider-Man vs. the Monster That Ate Los Angeles. 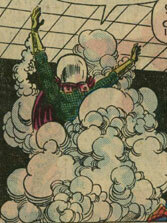 During the making of the film, Mysterio sabotaged the robot into attacking Spider-Man, who was saved by Daredevil. Dragoom had superhuman size, strength, durability, and a tail that could project electric bursts. 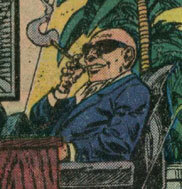 Lawrence Dyson was the chairman of the board of trustees for the Daily Bugle. When Spider-Man outed the Big Man as Frederick Foswell and connected him to the Bugle, Dyson visited J. Jonah Jameson and explained that the advertisers suggested that Jonah take a less direct hand in the Bugle's operations. He then offered Jonah emeritus status with full pay but Jonah angrily resigned instead. Electro was the same as his Earth-616 counterpart up until J. Jonah Jameson hired him to kill Spider-Man alongside many other supervillains. When Electro and the others nearly beat Daredevil to death, Spider-Man jumped into the battle, tackling Electro first. Electro had the ability to generate and control electricity, just like his 616 counterpart. The Enforcers were the same as their Earth-616 counterparts up until Spider-Man followed Betty Brant and witnessed her confrontation with them. Tracing them back to the Big Man, Spider-Man discovered the Big Man's secret identity. They were (from left to right): Ox, Fancy Dan, and Montana. The Fantastic Four were the same as their Earth-616 counterparts up until Spider-Man snuck into their headquarters. After a brief battle, Spider-Man explained that he was there to offer his services as a licensing and promotion agent. 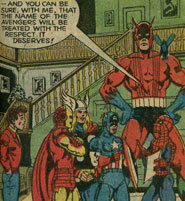 After they reluctantly accepted him as their agent, Spider-Man left to meet with the Avengers. They were: (from left to right): Mister Fantastic (stretching powers), Invisible Girl (invisibility/force fields), Thing (strength/durability), and Human Torch (flame control). The Fixer was a low-level criminal who fixed boxing matches, just like his 616 counterpart. After Daredevil tracked him down following the murder of his father, the Fixer had a heart attack. John Jameson was the same as his Earth-616 counterpart up until he perished during the course of his re-entry into the Earth's atmosphere during a space mission. J. Jonah Jameson was the same as his Earth-616 counterpart, not trusting superheroes and hating Spider-Man. Soon after Spider-Man became a media celebrity, Jameson was angry that the Daily Globe seemed to have an exclusive on photos of Spider-Man and when his son John died during a space mission, Jameson set out to discredit Spider-Man. Eventually discovering Spider-Man's identity thanks to Bugle reporter Ned Leeds, Jameson publicly revealed it in his paper, causing Spider-Man to retaliate by sending gunmen into the Bugle, then pretending like it was a joke to get his point across. When Spider-Man began promoting Daredevil, Jameson filed a court suit against Peter Parker, claiming that he supported a known vigilante. In retaliation, Spider-Man discovered that the criminal Big Man was actually Bugle reporter Frederick Foswell and revealed Foswell's connection to Jonah in an article for the Daily Globe. After that fiasco, Jonah was offered emeritus status at the Bugle but turned it down in favor of resigning. 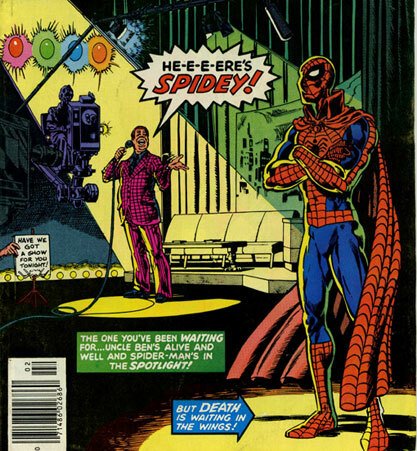 He soon was asked to meet with Frederick Foswell in prison, who offered Jonah the chance to get back at Spider-Man in exchange for running Foswell's rackets while Foswell was in prison. Jameson at first declined the offer but after realizing he had nothing else to lose, Jameson used Foswell's connections to gather an army of supervillains to kill Spider-Man (donning a cloaked costume to be a part of the hit himself). Upon his unmasking, he cried, exclaiming that Spider-Man was the villain, not him. Realizing that he had ruined Jameson's life, Spider-Man realized that he should have used his powers responsibly instead of for personal gain. Kraven was the same as his Earth-616 counterpart up until he was hired by J. Jonah Jameson to kill Spider-Man. Infiltrating Spider-Man's employees, Kraven snuck into a training session and poisoned Peter Parker using a set of poison-tipped claws. Kraven presumably had superhuman strength due to jungle potions, like his 616 counterpart. Mysterio was the same as his Earth-616 counterpart up until J. Jonah Jameson hired him to kill Spider-Man alongside numerous other supervillains. Secretly posing as one of Spider-Man's loyal employees, Mysterio sabotaged the robotic Dragoom to attack Spider-Man and later joined the other supervillains in disguising themselves as movie producers in order to get close enough to kill Spider-Man. When Mysterio and the others nearly beat Daredevil to death, Spider-Man jumped in and quickly defeated them all. Mysterio had a mastery over special effects, just like Earth-616 counterpart. Ben Parker was the same as his Earth-616, excepting that he was never killed by the Burglar, whom Spider-Man stopped. Days later, Peter Parker revealed his identity as Spider-Man to his aunt and uncle. Ben asked about Peter's educational career and reminded Peter that he had been given great potential. When Ben commented that he didn't want to see Peter waste his potential in front of a camera, Peter angrily left them. May was exactly like her Earth-616 counterpart up until Peter Parker left her and Ben in anger over what to do with his powers as Spider-Man. J. B. Priest was a famous movie producer whom Spider-Man contacted concerning the making of a movie starring himself. Priest commented that he didn't think people would go for a movie based on a guy with a few gimmicks, prompting Spider-Man to show his powers off for Priest. Impressed and little scared, Priest said he'd draw up the contracts immediately. Joe Robertson was the same as his Earth-616 counterpart and was present at the Daily Bugle when J. Jonah Jameson resigned in front of Lawrence Dyson. Sandman was the same as his 616 counterpart up until he was hired along with many other supervillains to kill Spider-Man. Joining the villains and disguising himself as a movie producer, Sandman attacked Spider-Man but was met in battle by Daredevil, who was guarding over Spider-Man. After Sandman and the others nearly beat Daredevil to death, Spider-Man jumped in and glued Sandman where he stood using his web fluid. Sandman was essentially living sand that he could morph at will, like his 616 counterpart. 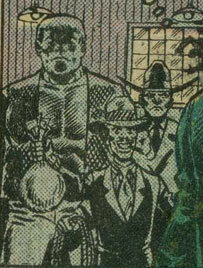 Slade was a lackey of the Fixer who, when the Fixer suffered a heart attack, confessed of his crimes to the police. He was rounded by the police when Daredevil arrived on the scene. Peter Parker, like his Earth-616 counterpart, gained superhuman powers from an irradiated spider bite. First using his powers in a wrestling match, Spider-Man witnessed a burglar and when the police officer yelled to not let the burglar get away, Spider-Man stopped him, feeling that an act of heroism might be doing himself a big publicity favor. Gaining newspaper headlines, Spider-Man then sought out movie producer J. B. Priest and began making a movie. Soon after, he also guest-hosted The Tonight Showand then revealed his identity to his aunt and uncle. Angry that his aunt and uncle wanted him to further his education, Spider-Man left them behind and became a famous movie star. When Daily Bugle editor J. Jonah Jameson had Spider-Man's identity uncovered and published in his paper, Spider-Man threatened Jameson by hiring a group of gunmen to dress up in costumes and threaten Jonah. Then, after Jameson was terrified for his life, Spider-Man arrived and gave Jameson a plaque for outstanding journalism, making Jameson think it was a joke but still leaving him scared enough to back off the bad press. Spider-Man soon set his sights on becoming a licensing and promotion agent for other superheroes, signing up the Fantastic Four, the Avengers, and the X-Men, before moving on to the vigilante Daredevil. When J. Jonah Jameson returned and filed a court suit claiming Spider-Man promoted a known vigilante, Spider-Man followed Jameson's secretary when she was confronted by the Enforcers over her brother's gambling debts. Discovering that the Enforcers were hired by the Big Man, better known as Daily Bugle reporter Frederick Foswell, Spider-Man wrote an article connecting Foswell to Jameson for a rival newspaper. Jameson soon resigned from the Bugle and Spider-Man began making a sequel movie, not realizing that Jameson had hired supervillains to strike back at Spider-Man. After being saved by Daredevil when the robotic Dragoom zapped him, Spider-Man was poisoned by an undercover Kraven the Hunter and while he recovered, he admitted to Daredevil that someone was out to kill him. The two were soon trapped by a small army of supervillains and when Daredevil was beaten nearly to death, Spider-Man jumped in and defeated the villains. Unmasking their mastermind, Spider-Man was shocked to see J. Jonah Jameson, who claimed Spider-Man had ruined his life. Realizing Jameson was right, Spider-Man learned a harsh lesson about using his powers responsibly. Spider-Man was later drawn into a conflict between spider-totems (those with spider-related powers) from across the multiverse and the dimension-hopping Inheritors of Earth-001, who were feeding on the totemic energies of the spider-totems. Spider-Man battled against the Inheritors before presumably being returned to Earth-80219 upon the Inheritors' defeat. Spider-Man had superhuman strength, durability, agility, and a spider-sense that warns him of danger. "Flash" Thompson, like his Earth-616 counterpart, was the local bully at Midtown High School. After Peter Parker gained his spider-powers, Flash tried to bully him around but Parker just egotistically brushed him aside. Sgt. Edward Via was the police officer who detained J. Jonah Jameson for questioning after Frederick Foswell was revealed to be the Big Man. The Vulture was the same as his Earth-616 counterpart up until he was hired along with many other supervillains to kill Spider-Man. He attacked Spider-Man and Daredevil together, nearly killing Daredevil before Spider-Man jumped in and made quick work of the villains. Vulture wore an exoskeleton that boosted his strength and enabled him to fly, just like his 616 counterpart. Wanda was a friend of Annie and attended the premier of The Amazing Spider-Man movie, reminding Annie that she had a boyfriend. The X-Men were the same as their Earth-616 counterparts up until they signed up Spider-Man as their licensing and promotion agent. They were (from left to right): Cyclops (optic energy beams), Marvel Girl (telekinesis), Angel (wings), Iceman (ice generation), and Beast (strength & agility).